We recommend 200 steel U-pins per roll for grass reinforcement mesh 2m x 20m rolls so please click the above link to purchase an additional 100 pins we recommend. 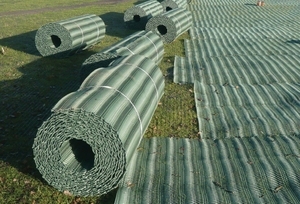 GrassProtecta Medium 2mx20m plus 150 fixing U-Pins is a NEW 13mm thick plastic mesh manufactured in England by TERRAM. The thick 13mm plastic mesh works by protecting grass roots from damage, spreading vehicle traffic loads (cars, people and other vehicles) and providing a reinforced grass surface in areas that would normally be affected by worn grass, muddy areas and rutting caused by car wheels. GrassProtecta grass reinforcement mesh is fixed to the grass and secured in place with the u-pins supplied and allows the grass to grow though. Once the mesh has disappeared the grass roots will start to interlock with the mesh and create a stable surface ideal for car traffic. Our 13mm thick grass reinforcement mesh can be used to protect and stabilise the ground for grass car parking reinforcement, lawn parking, garden paths, grass verge parking areas, worn grass access routes.